In Navratri festival eighth and ninth day is considered very auspicious. 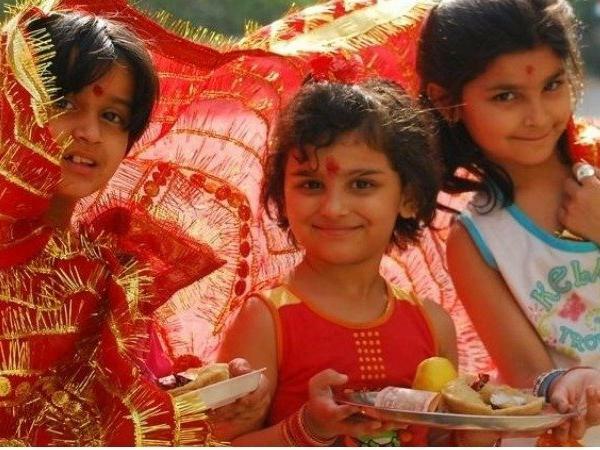 It is a rule of inviting girls in the form of nine Goddess, in the last Navaratri on the day of Durgashtami or Navami. The devotee’s Navratri fast is completed only after worshipping the nine girls and giving them dakshina. It is believed that mother Durga is pleased by worshipping nine girls and blesses the devotee with happiness and prosperity. Some people keep Kanya Pujan on Navami day and some people on Ashtami day. 1. You can invite the girls day before you plan to do Kanya pujan. 2. The age of girls should be between two to ten years. 3. It is rule of inviting 9 girls and one boy, but if more girls are present than also it is ok.
4. In the morning take bath and clean the area where you wish to do puja. 5. Make Navratri prasad for puja which include halwa, kale chane, puri, kheer. 6. After preparing the Navratri prasad, give bhog to Maa Durga. 7. Wash feet of the girls and boy and make them sit in a clean and comfortable place. 9. Serve them prasad and give them some gifts. 10. 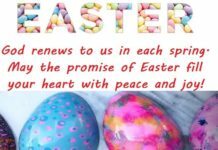 Before sending them back from your house touch there feet and seek blessing. 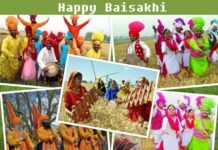 Next articleHappy Baisakhi 2019: SMS, wishes, greetings, WhatsApp messages and Facebook quotes.